Natalie Coughlin is an American competitive swimmer and a twelve-time medalist. With her high medal count, she is tied for the most winningest American female athlete. Natalie is also the most decorated female swimmer in World Championship history with 17 medals. Natalie became the first woman to win back-to-back Gold Medals in the 100m Backstroke and the first American female athlete in the modern era to win six medals in a single global competition. Natalie’s affinity for health and nutrition go hand-in-hand with her natural lifestyle and green mentality. She is an avid surfer with a deep passion for the environment. She also embraces the use of renewable resources and local organic produce, maintaining and cultivating an organic garden at home to fuel her love for cooking. Natalie helped children around the world receive an $85,000 donation to Right to Play made through the Hearts of Gold program. Leading up to Beijing, Natalie participated in USADA’s Project Believe campaign, voluntarily participating in extra blood tests in an effort to speak out in support of clean competition. 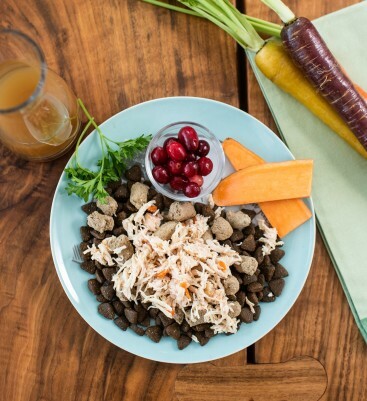 When Natalie wants to give Dozer and She-Ra a special treat, she enjoys creating this Turkey & Sweet Potato Kibble with Freeze Dried Turkey & Cranberries with Organic Chicken Broth topped with Salmon & Carrots. Nulo recipes include real blueberries, cherries, cranberries and other superfoods to provide valuable immune system support for healthier pets.